This entry was posted in Books and tagged Blackie, Charles Rennie Mackintosh, E.J. 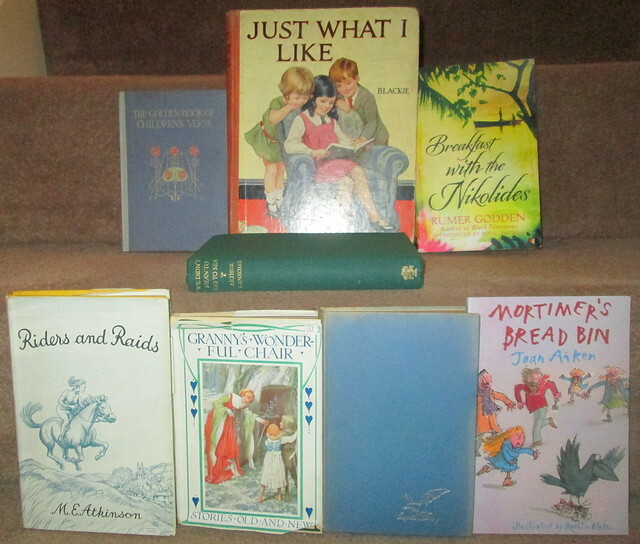 Oxenham, Frances Browne, Joan Aiken, Just What I Like, M.E. Atkinson, Rumer Godden by Katrina. Bookmark the permalink. 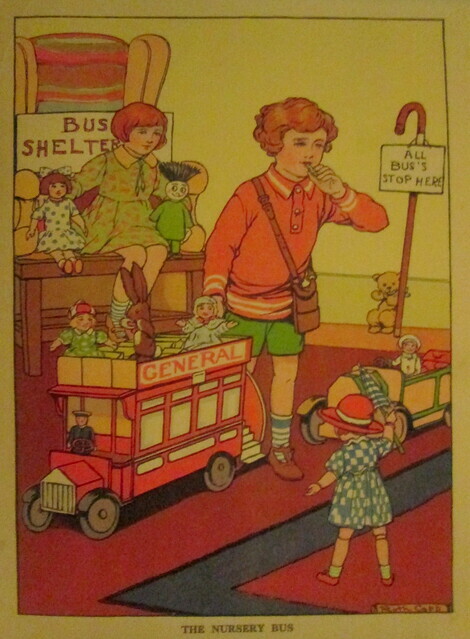 What delightfully illustrated covers….I would have wanted those books just for the covers alone! 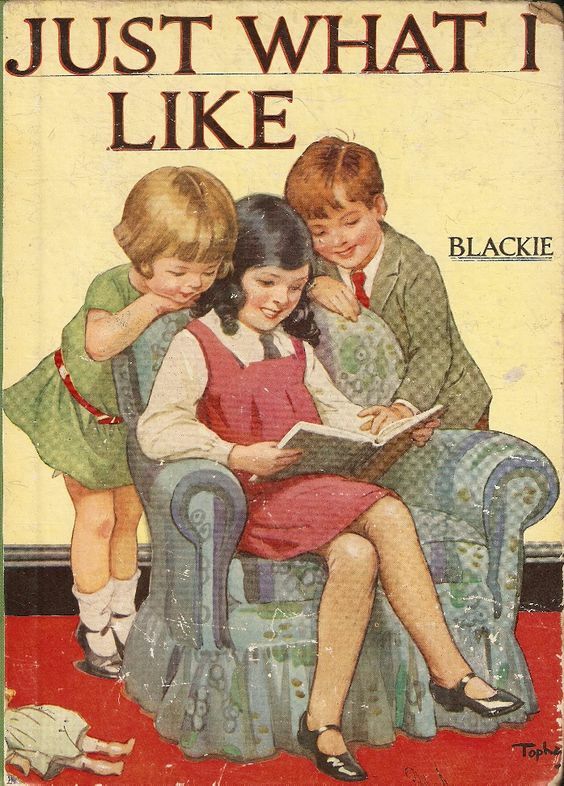 I’m not familiar with the Blackie and Son publishers. Did they only publish books in Scotland? I’ve been wanting to read something by Rumer Godden but haven’t made it happen yet. You’re inspiring me to visit some good used book places in our area. Blackie and Son would have sold their books all over the British Empire so I think there will be a lot of them in Canada. You should have a look on your Ebay, mind you I only paid £5 for the large book and £2 for the small ones, on Ebay here people are asking more. I hope you’ll be lucky and find some, maybe at a thrift store. This is a marvellous haul, Katrina. I’d be with you though, regarding those apostrophes! I’ve noticed recently that sign writers are just ignoring apostrophes completely, it always used to be – when in doubt – they stuck one in! I have to admit that I’m partial to Two Joans at the Abbey! I love the illustrations in the Blackie books, too. What a lovely stack of books. I couldn’t say no to Two Joans! The big Blackie book is full of lovely illustrations. Interested to learn about the Charles Rennie Mackintosh design for the book-cover, that’s an aspect I’d not thought of, but *of course* someone must be responsible for those beautiful Art Nouveau designs. I may have that wee book somewhere myself, just couldn’t see it on my shelves at the moment. We Didn’t Mean to Go to Sea is a wonderful story! Back then they didn’t seem to give the cover designer a mention, but it’s known that he got a lot of work from Blackie in publishing and also in the Blackie family home – Hill House in Helensburgh which CR designed top to bottom, designing all the furnishings too and his wife Margaret Macdonald designed and worked the embroideries, chair covers and such. Sadly Hill House has terrible problems with dampness now and they’re actually building a cover over the whole building to try to protect it from our weather. I’m going to read the Ransome books in order – so I had better get on with it! I simply love it when you invite a few more books into your home, Katrina. It makes me feel 100 percent okay if I do the same thing, and we are book collectors after all. I console myself by saying I don’t collect anything else. I have been carting a box here, and a couple of boxes there over the past year to library book sales. But I hate to get rid of a single book. I argue with myself over each and every one. Breakfast with the Nikolaides… I recently purchased this one for the Nook, when it became available for $1.99. Those books practically mugged me! I just couldn’t say no, but there are worse addictions to have! I put books in a bag and leave them in the garage for six months before taking them to a charity shop. It’s a sort of cooling off period as I’ve got rid of so many books previously and then regretted doing it. Often I take some of the books back into the house again as I’ve decided I don’t want to part with them. I laughed so at the fact that the books mugged you. I know the feeling all too well. I agree that I’ve regretted letting go of a book or three. The “cooling-off” idea is one I’ll try. One thing is sure, if I really like a book, or if I really like an author, I cannot for the life of me part with a book or an author’s books. I briefly hesitate before going into any second-hand bookshop as I know I’m likely to be mugged – but I just can’t help myself, there might be something wonderful in there and very often is!